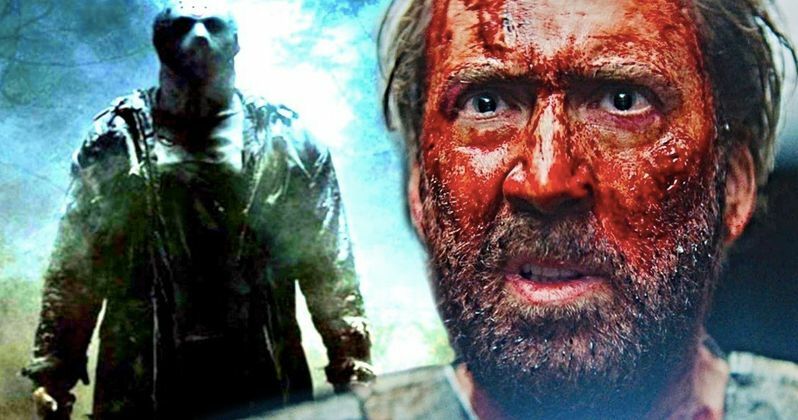 Nicolas Cage has revealed that Friday the 13th slasher Jason Voorhees was an inspiration while he was working on his latest movie Mandy. The off-kilter slasher film has become a hit on the festival circuit, much to the surprise of nearly everybody involved. Cage plays Red Miller in the movie who goes on a bloody rampage to seek revenge on a religious sect who are responsible for killing the love of his life. While the premise sounds like a story that has been told numerous times, Mandy throws everything off and keeps things fresh and interesting, which is putting it lightly. Before Nicolas Cage's Red Miller character ends up taking a "supernatural drug" in Mandy, the actor likened his fighting ability to that of a feral cat. But, that doesn't last for long as the drug takes hold. It's here that Nicolas Cage says Jason Voorhees from Friday the 13th came into play, which he attributes to director Panos Cosmato. Cage had this to say about the drug's effects on his Red Miller character and where the Voorhees influence helped. "Whereas after the drug, there's a transformation where he becomes almost like a golem, the ancient Jewish golem that was a supernatural statue that came to life. And I think Panos wanted that, he wanted me to be almost like Jason-esque, you know, from those horror films that were so popular. Panos and I really both decided what the graph of the performance would be. How much more Jason-esque is he there? Or like a statue there? We built this both together." It appears that the supernatural drug in Mandy that Red Miller takes unlocks something within him that allows him to become a stalking silent murderer, much like Jason Voorhees, except for the choice of victims. Jason normally prefers teenagers, while Miller is out hunting for a religious sect and drug-fueled bikers with an axe, along with other weapons. Nicolas Cage is no stranger to going over-the-top for a role, but in Mandy, he's absolutely unhinged. To make matters even more interesting, Nicolas Cage was recovering from a broken ankle when production on Mandy started. The actor says that he didn't want to lose the part, so he dove head first into the project, which he claims was a form of rehabilitation for his ankle. Cage says that the stunt work helped with his recovery. He explains. "I was coming off a broken ankle. I didn't want to lose the movie, but while doing all those fight scenes, and preparing for it, I was still kind of going through rehabilitation on my leg. Oddly enough, the stunt work actually helped with my recovery, because it got me using those muscles again, and got me functioning again, whereas I'd been in a wheelchair for three months." Not only did Nicolas Cage channel Jason Voorhees in the upcoming Mandy, but the bloody stunt work also served a form of extreme physical therapy for his ankle. Cage attributes having to learn all of the stunts and fighting scenes in a short period of time the reason that he was able to do the movie and not sit in a wheelchair for a month. Whatever the case may be, Mandy is getting rave reviews, so look out for it when it hits theaters on September 14th. You can read the rest of the interview with Nicolas Cage at Entertainment Weekly.